Photo: A girl studies at our school in a Kampala slum colony. Studies have shown that education is the key to preventing the rampant rise of the trafficking of minors. May 6, 2016. Today we bring you an important update from our native team operating in the slums of Kampala, Uganda. Due to unusually heavy rain beginning in April, the area has experienced severe flooding. The destructive weather has affected our Children’s Hope Center since it is located in a colony situated at the bottom of sloped terrain near the shores of Lake Victoria. Thus, sadly, much of the sewage and rainwater drainage of neighborhoods in higher elevations collects in stagnant pools causing flooding problems during the rainy season. The current flooding washed the soil away, flooded and destroyed our pit latrine toilet, rotted our school desks and washed some of them away, ruined many of our textbooks and other school supplies, and weakened our floors. Thankfully, we have been able to make some improvements, such as repairing the toilet facilities — we closed the latrine because it was full and the children had nowhere to go, but we have now succeeded in renovating the toilet. In addition, we recently built three permanent buildings and plastered them inside and out, and purchased permanent blackboards for teachers to write on while teaching the students. We also acquired a small plot of land outside the classroom buildings where our temporary outdoor kitchen is located, and it provides a space for the children to gather for morning assembly. These improvements are an answer to prayer since the school is vulnerable to rainwater runoff and pooling during rainy seasons. With your support and contributions from our generous donors, we hope to make more improvements to fortify our school in preparation for future flooding. We hope to purchase another plot of land where we can construct a strong structure for a new school, cultivate a garden, and build an orphan home and a medical clinic. An alternate idea is to rebuild our current school building with bigger and higher foundations, and fence the surroundings so that we can prevent water from coming in to the school. These improvements would be a great answer to prayer, and would ensure the safety and comfort of our children. Our slum outreach program is operated by locally empowered leadership in Uganda. In its current humble facility the center offers a Kindergarten through 7th primary education for 127 children who would otherwise have no access to education. The children are studying a complete curriculum with subjects such as English, physical education, mathematics, science, reading, and social studies taught by qualified, salaried teachers. Many of our students have been rescued from extremely hazardous child labor situations, which are often a precursor to human trafficking. Our director shelters some of the at-risk orphan students in a transitional boarding facility near the school. We hope to build a better facility to ensure the best care possible for these children. Orphans girls in Uganda are especially vulnerable to human trafficking, so it is our priority to work for their protection, education, and care. Studies have shown that education is the key to preventing the rampant rise of the trafficking of minors. 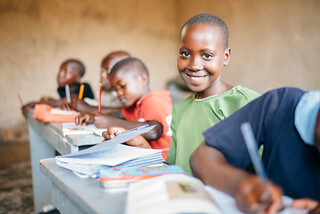 With your continued support, we hope to further bless the lives of our students and hard-working teachers by building more classrooms, improving facilities, buying exams for the end of each semester, buying books and desks, and paying our dedicated teachers who volunteer to teach our children. As always, we are extremely grateful for your faithful prayers and support, enriching the lives of our children physically, spiritually, and emotionally.